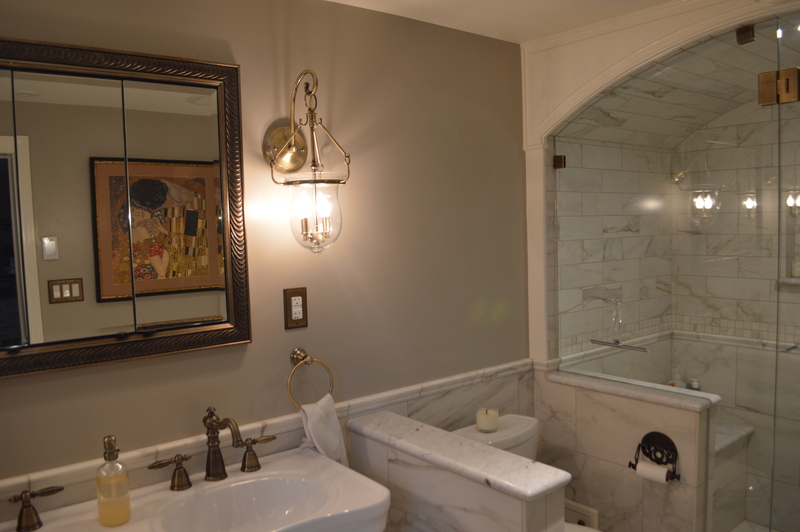 Allow me to finally share with you a long-overdue post: the FINISHED BATHROOM! We have had this wrapped up for a while now but I just never seem to find the time to write a blog post. Sorry for the delay, but better late than never? To remind you what the old bathroom was like: see here. To remind you what my goals were: see here. And the latest progress on it before the completion: see here! After lots of research and work– albeit the installation done 100% by our contractors in this room– it is done! 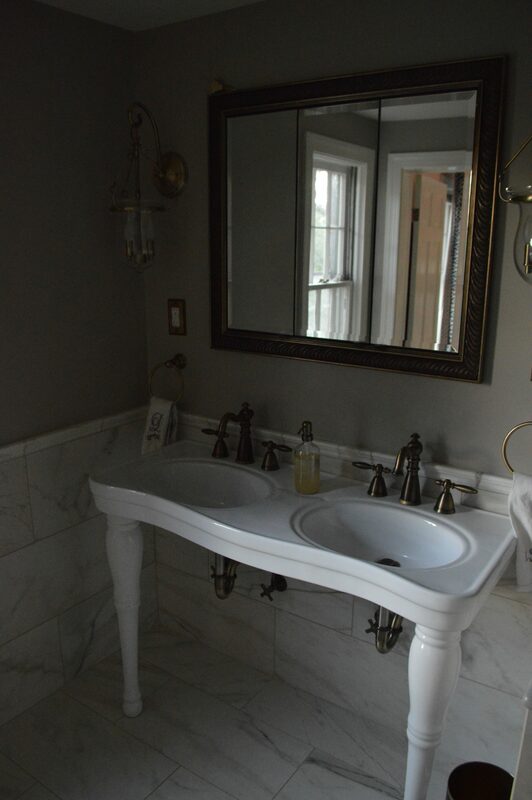 We opted for a double console sink and I am so glad we did. I love having a separate sink from David when we’re both getting ready for work in the morning, but I also love how beautiful the lines of this sink are. It makes the room feel a lot larger in my opinion because it’s not a big bulky sink. We got a nice big vanity mirror that holds a lot– storage was key because we have no under-sink storage– and it at first seemed a bit small for the space, but now I think I love that because it looks even more like an old farmhouse… it’s not supposed to be perfect. 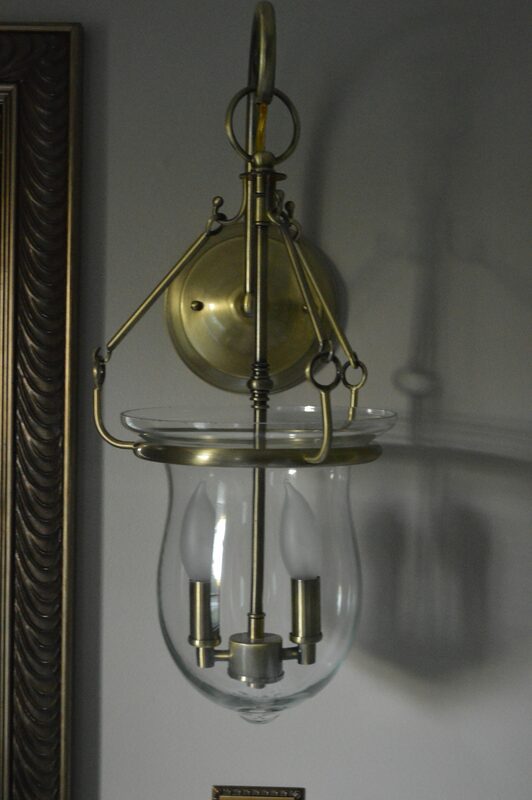 It’s supposed to be like artwork that you hang because it was passed down from your great-great-aunt, even if it doesn’t fit the space perfectly. 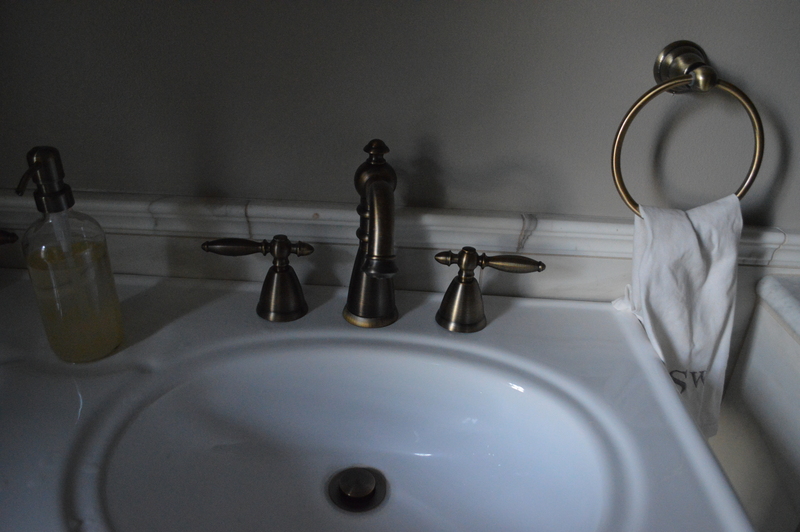 We went for antique brass faucets (all the links of where we bought everything are at the end of this post) and they work really well with the antique feel of the sink, even though everything is brand new. The lights mirror the other lights around our house except for their finish, and I love how they kind of tie in the decor to everything else. 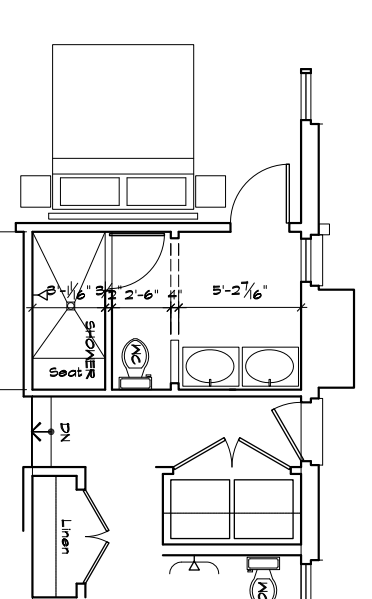 To the right of the sink is a little half-wall and then the toilet, followed by the shower! 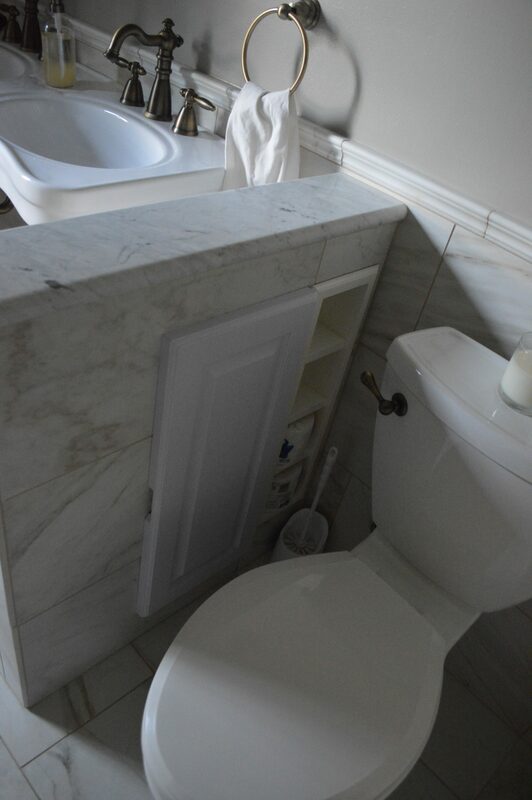 The half-wall by the toilet is actually just an opportunity for more storage. 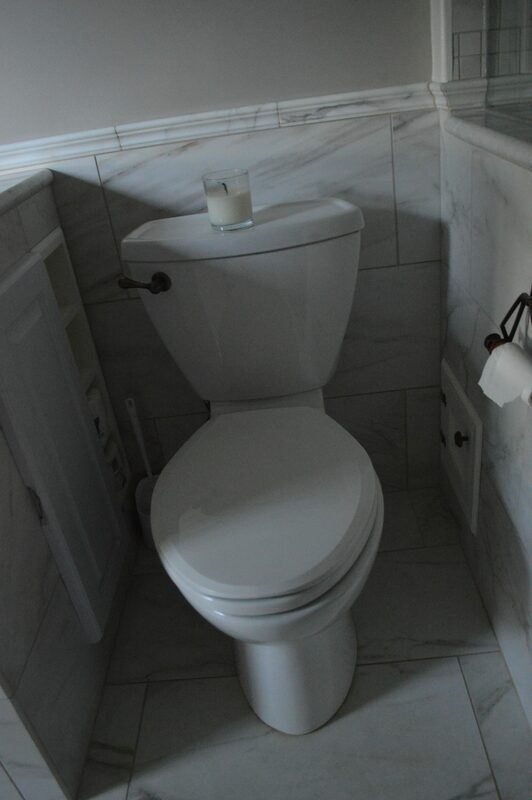 We had our contractors devise little cubby holes for toilet paper and the little panel to the side holds the toilet plunger! I love how we were able to utilize all that space and free up the area usually used under the sink for storage. 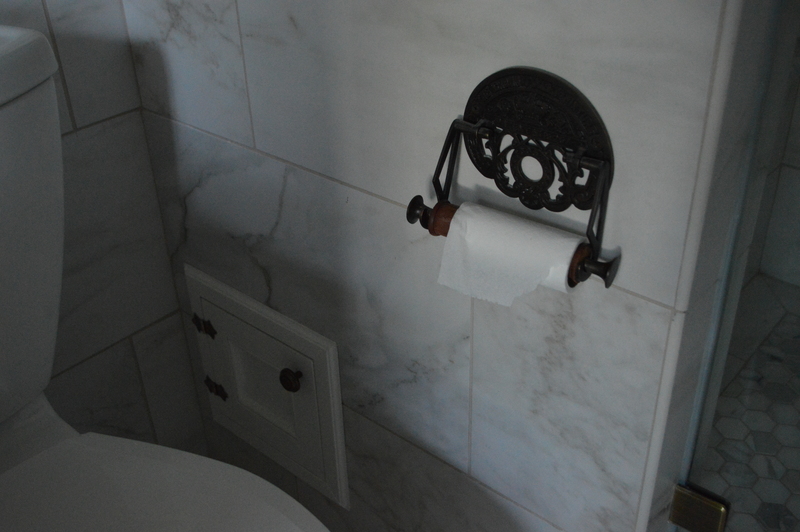 We bought an old fashioned toilet paper holder, adding to the antique farmhouse vibe in the bathroom, and the contractors built another cubby hole under the shower seat for more storage. I am head over heels in love with this shower. 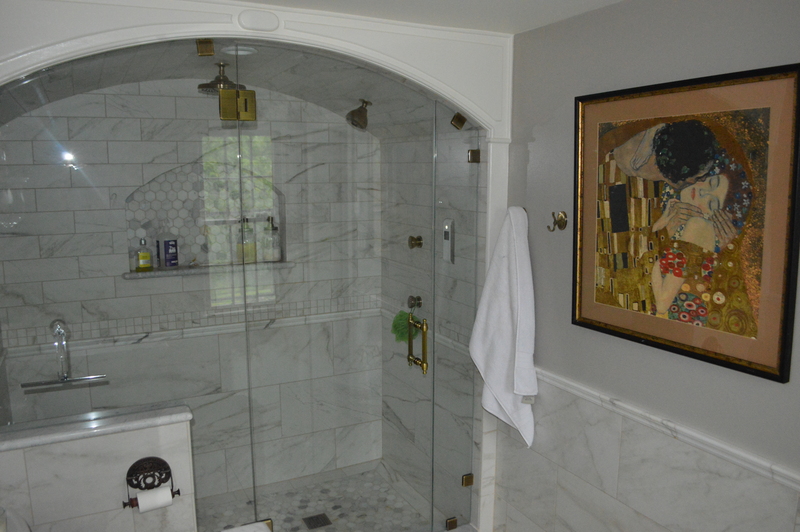 It is seriously my dream shower, and I didn’t even know I had a dream shower until I started designing it. It has a shower bench, a rain faucet at the top, a more pressurized faucet on the side, and two wall faucets. 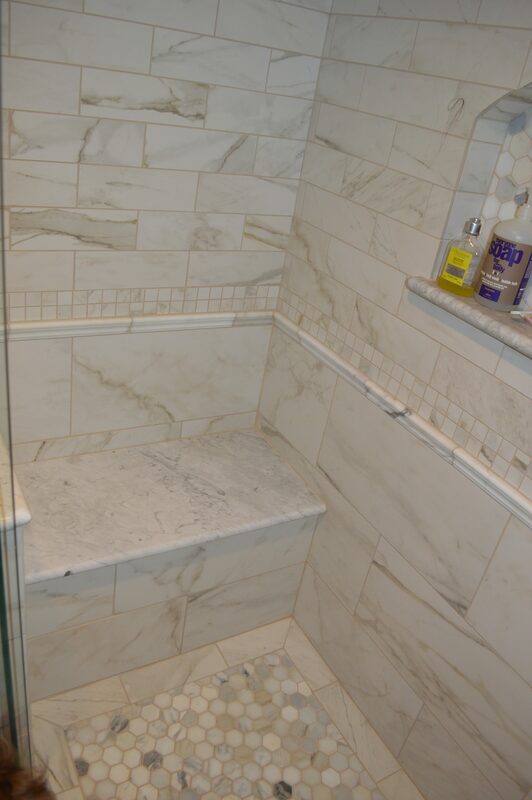 Side note: we completely failed to budget for installing shower doors when we designed the bathroom. Ooops. 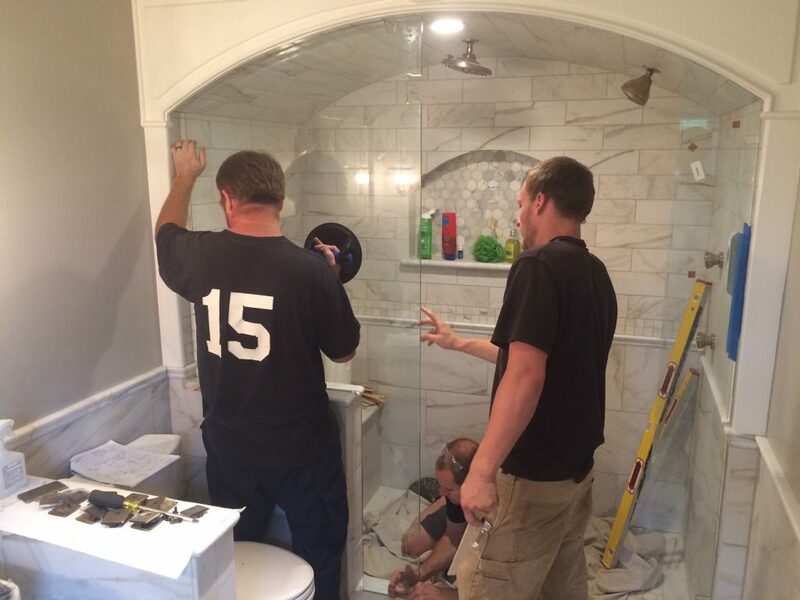 When the guys came to give us an estimate, they reminded us that due to the custom arch/ shape we had, they had to come up with custom shower doors…. needless to say, we totally blew the budget on this one. Sigh. Lesson learned. 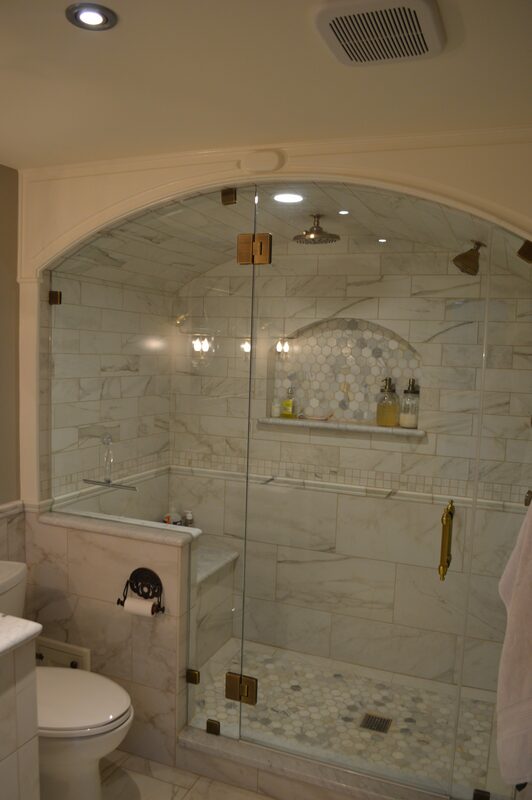 The shower doors and the arch turned out to be absolutely perfect. The door opens toward the wall so we can grab our towels from the hooks right there without having to walk all over the bathroom. 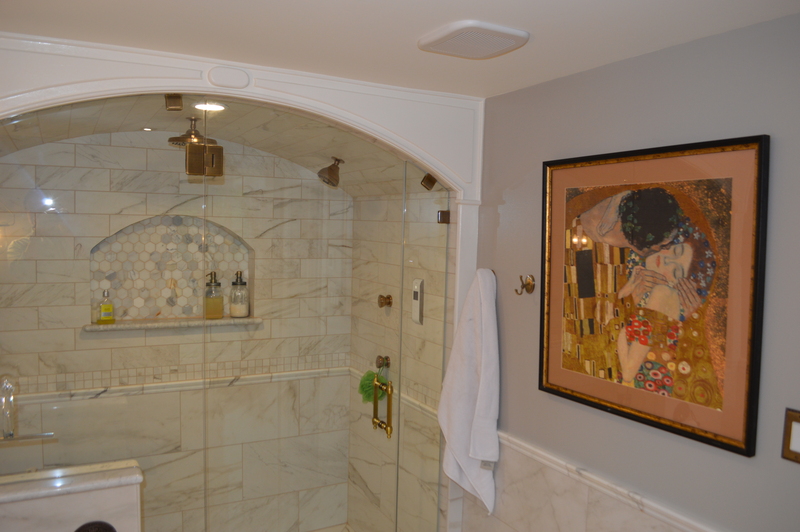 And now allow me to show off the tile work in shower, which I think turned out particularly great. 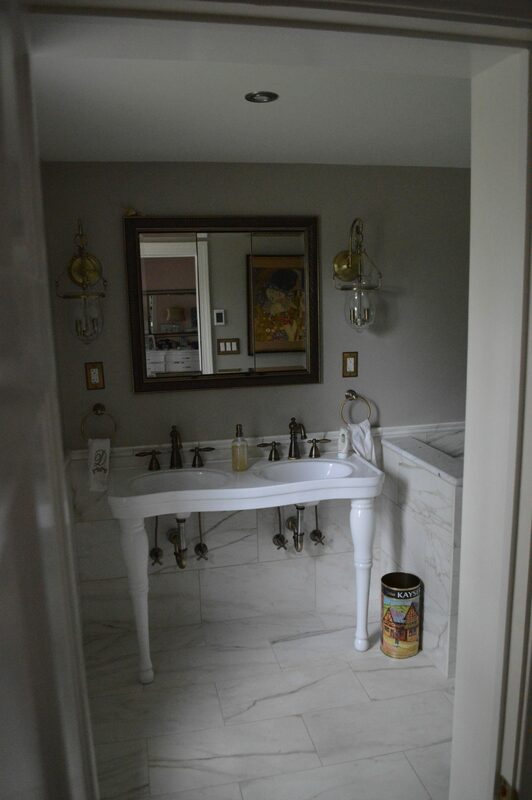 As I wrote in a previous blog post, this tile is mostly fake but designed to look like Calcutta gold marble. 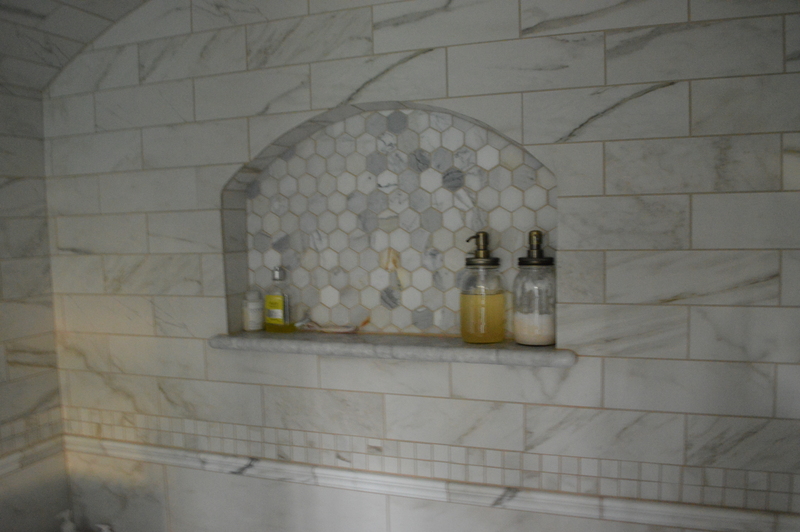 The only marble that is real is the chair rail, the hexagon tiles on the floor and in the little nook, and the slab for the shower bench. I should mention this shower has no handle to turn on. 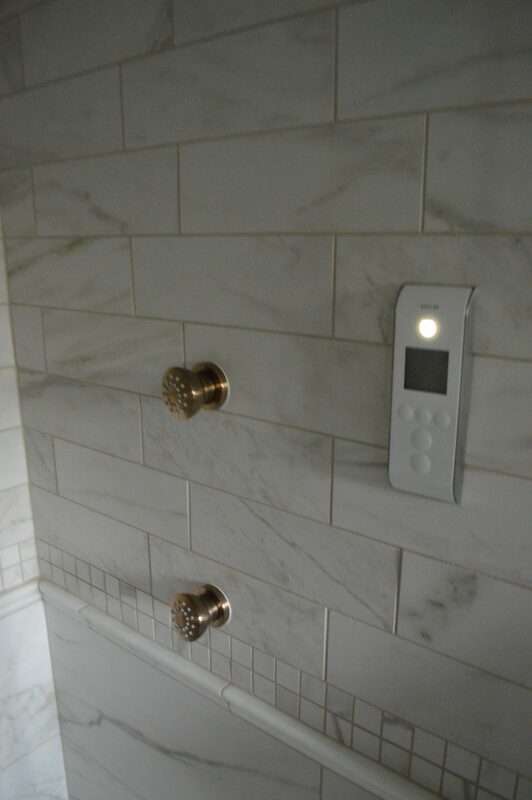 It is an electronic system (designed by Ferguson– they were wonderful to work with) and you simply press the power button and designate what you want to use (I like using both the rain bath and the wall spigots myself), then you set it to the proper temperature. I used to live in an apartment in Duisburg, Germany that had the most unpredictable shower water EVER and it left me semi-traumatized by taking showers… since living there I have not been able to trust that a shower will not go from normal temperature to scalding hot to freezing cold in ten seconds, and this new system we had installed is the lap of luxury for me. I can take a shower and know that it will stay at whatever constant temperature I set it to. Amazing. 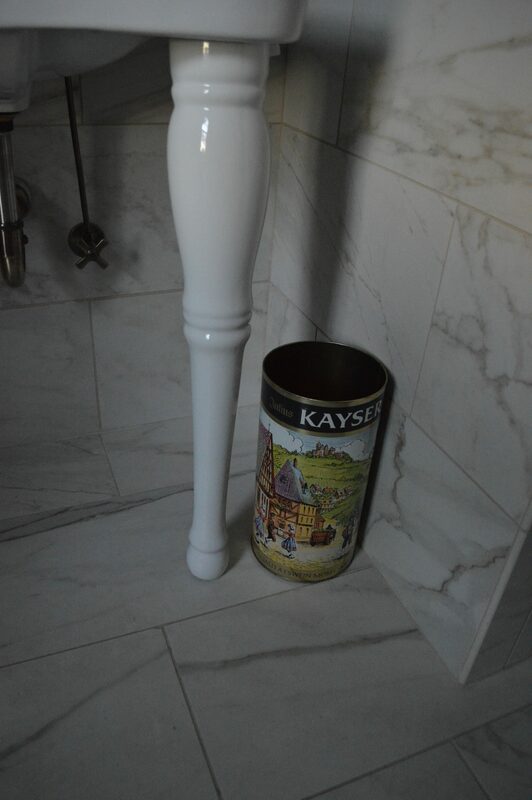 One little touch that makes it special is the trash can from Germany that my mother-in-law found at an antique shop. Our dog’s name is Kaiser, and this says Kayser on it. So not only is it from Germany (which I find particularly cool) but it is perfect for us. I think it was made to hold a wine bottle from Mosel at one point but it works well for our trash can. 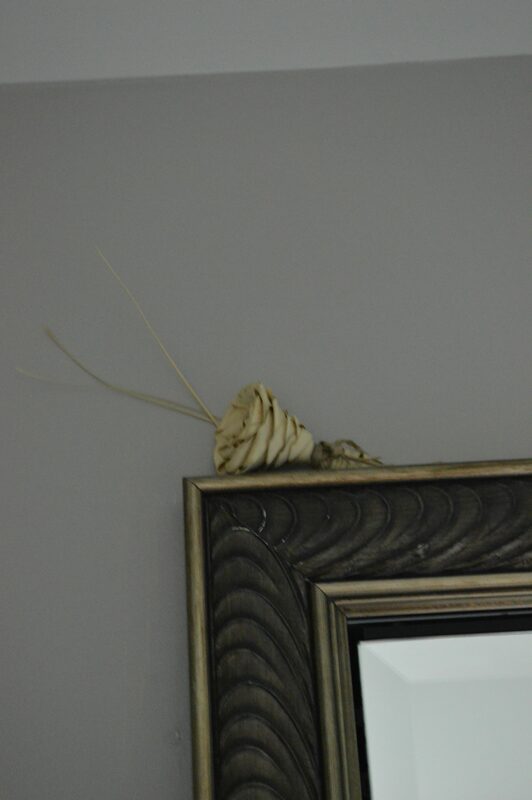 And lastly, the boutonniere David wore at our wedding is tucked in the top of the medicine cabinet. It’s made from sweetgrass (as in a basket) from South Carolina, where he’s from. It’s a very very small touch, but it reminds me of the happiest day every time I see it. Our very special, will-last-us-for-the-rest-of-our-lifetime, bathroom! (I promised David I would never redecorate this room so this was a one shot deal, haha.) Even though we ended up going over budget, I’ve got to say I love how it all turned out and I wouldn’t change a thing. And eating Ramen noodles for months is fine, right? Previous postAnother New Addition... Next postBuilding a Chicken Run -- A Weekend Project?? I love it, the shower is so luxurious, it gives me 1920s glamorous vibes, it has a slightly art deco feel and i love that sink! Thank you!!!! I get the same feeling from it!